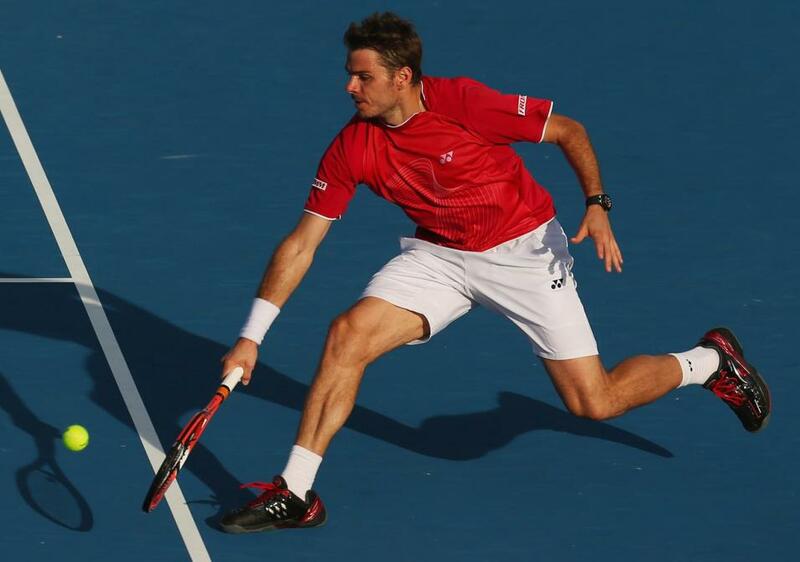 Can Stan Wawrinka continue his good form in majors? "Wawrinka's slam efforts last year, where he reached the last four in New York and fourth round here are encouraging..."
There have been a number of conflicting reports and comments from players and coaches as to the speed of the courts in Melbourne this time around after conditions in the warm-up events in Brisbane and Sydney were faster than was previously the case. Some of the qualifiers have stated that the surface is quicker than they've seen it in the past, while others are pointing to the Wilson balls utilised this year being faster. The chances are that it will remain at best a medium paced court with conditions varying depending on the weather - it's forecast to be very hot in Melbourne this week. Our favourite this fortnight is Melbourne specialist and number two seed Novak Djokovic, who has won the last three in a row and for four of the last six renewals. The Serb is a [2.0] shot to make it four straight titles and he has barely been seen so far this campaign, as he chose to play a couple of gentle exhibitions rather than any tournament play ahead of this first major of the year. All the talk has been about Djokovic bringing Boris Becker into his team and for the life of me I can't see what the German brings to the table. It's certainly not insight and it can't be tactical, so exactly what Becker can offer remains a mystery. Djokovic will not like it if the courts play significantly quicker than normal here and although I expect him to be a big threat and the most likely winner that [2.0] is short and this event may be more open than recent majors have been. His draw looks kind too, with Stan Wawrinka looking the only threat to another strong run from the champion. Andy Murray comes here in poor shape having undergone back surgery and his only match practice since the autumn has been a couple of exhibitions, a simple win over a no-hoper and a loss to Florian Mayer. The Brit looks a hopeful bet at best at around [12.0] in such circumstances, but his draw looks good, with Roger Federer a potential last four opponent and Jo-Wilfried Tsonga a possible in the quarters. I can't see Murray making it through that quarter this time around. 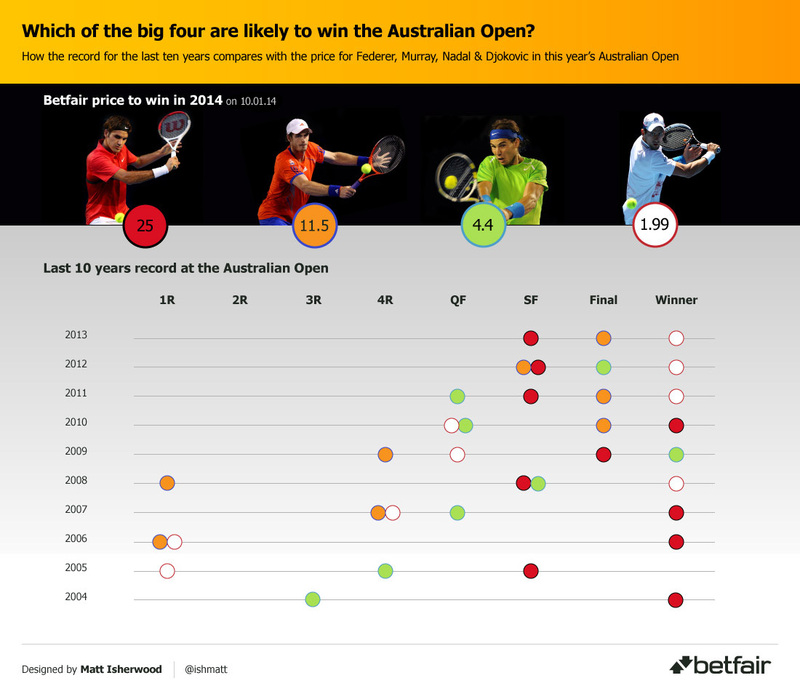 Federer has been using his new Wilson prototype racquet so far this season and it almost brought him the Brisbane title, but a loss to Lleyton Hewitt in the final there on a surface tailor made for the Swiss shows how his level can vary greatly from match to match in this closing stage of his career. His price of [25.0] is probably about right. He hasn't made a major final now since Wimbledon in 2012 and last season's slams included losses to Tommy Robredo and Sergiy Stakhovsky. Rafa Nadal is trading at around [4.3] and that's arguably just about the best value of the four big names. Nadal has had stem cell treatment on his troublesome knees and although he was not at his best in Doha on his return he did win the tournament in conditions that were quicker than he's comfortable with. A similar sort of surface here this fortnight would greatly diminish his chances and he's been handed a real test first up in Bernard Tomic. Trading at around [16.0] is Juan Martin Del Potro and he has to come into the reckoning based on his performances last season, however his record here is poor, with just two quarter finals to show from his seven visits to Melbourne Park. He's the kind of player who needs matches to get a rhythm going and I think this comes too early in the season for the Argentine. Not since Tsonga back in 2008 has a player outside the Djokovic/Murray/Nadal/Federer quartet made the final and if you fancy that trend to end then it could pay to look to the likes of Wawrinka, Marin Cilic, Tomic or Tomas Berdych as back-to-lay options. Wawrinka withdrew from the exhibition event in Kooyong due to exhaustion after winning Chennai, which was sensible and his slam efforts last year, where he reached the last four in New York and fourth round here are encouraging. On both of those occasions he was beaten in five by Djokovic and he also made the last eight in Paris, so at [70.0] he has to enter the thinking. Cilic has improved his serve substantially during his enforced absence and on his day can be a real handful for anyone, while Berdych is also dangerous, but his price has more than halved since the draw. David Ferrer is the main opposition to Berdych and the Spaniard doesn't look in the kind of shape to mount much of a challenge to me. His chances of a landing a slam are remote at best and get worse as time goes on. Tomic remains ten times the player in Australia than he is elsewhere, but it's hard to see him being more than a potential banana skin for one of the top seeds. His final will be first up against Rafa and [210.0] seems fair enough a price. So, Novak looks the most likely winner, but better value lies in chancing Wawrinka at [70.0] and in the 'quarter winners' markets, where opposing Murray and Ferrer looks the call. Remember, to bet on any Aussie Open market you'll first need to transfer funds to your Australian Wallet. Find out more in this video.